When my oldest daughter was 4 we lived in Washington, DC (yes, this was 26 years ago). When her birthday came along I asked her what she wanted to eat for her special dinner and she answered, chicken fried steak. Huh? I had never heard of it before—and this was before the Internet, so I couldn’t google it or anything. So I just said “OK, Honey!” and went out and got some good old Chinese spare ribs. She thought it was great and that was the last I thought about it for a good 10 years. 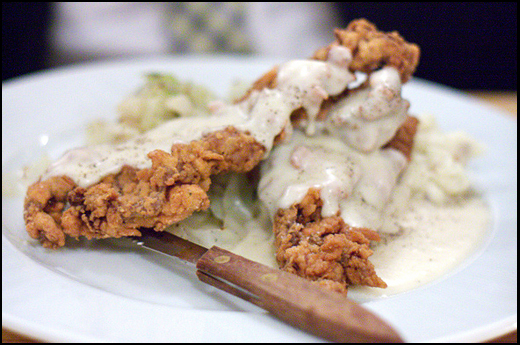 Then I went to Texas on business, and imagine my surprise when I saw Chicken Fried Steak on a menu (Texas claims to be the dish’s birthplace). It was a real thing! Of course I ordered it and, yes, it was a very good thing. Since then, whenever either of us sees it on a menu, we order it and enjoy it (sparingly, of course; it’s not the healthiest thing you can eat!). But I had never ventured into making it until recently. I was in Austin, Texas, for the South by Southwest Eco Conference and was hanging out with Tom Phillpot, a native Texan. We were searching for a good restaurant within walking distance (not too many choices) and we got to talking about chicken fried steak (CFS). “That’s it,” I said, “I’m making it as soon as I get home.” For three reasons: 1. Maya and her husband Tony were coming for the weekend, so I could finally make it for her even though it wasn’t her birthday. 2. If I make it myself I could use all organic ingredients. 3. It was about time I figured it out. And so I did. And it was good. And the leftovers were consumed at breakfast the next morning. It wasn’t too hard to make, but it was a bit of a production. I’d do it again when the craving strikes. According to Tom, it must be served with mashed potatoes and green beans. I will share my green bean recipe soon—that was yum, too. A note about the meat: Typically, CFS is made with a cheap cut of beef that is pounded to tenderize it. But I buy my organic meat mostly at the supermarket, and my options are limited. I don’t like fatty meat unless it’s crispy, and the way CFS is cooked, the fat will not crisp-ify, so I bought the good stuff (tenderloin). And it was good! Pour out most of the olive oil until there is just a nice light coating on the bottom of the pan. Make sure you leave all the good stuff—the little bits of flavor. To serve, put the CFS on a plate with the mashed potatoes and green beans. I serve the gravy separately so people can add their own at the table. CFS is second only to Schnitzel. I think she learned about it from some kids at day care! She went to a friends school in Washington DC that had kids from all over the country and world. In fact, it was probably her best friend Eddie Thurston Jr. who told her about it, I’d guess! She certainly learned about a lot of other things from him! (mostly how to cuss). I’ve known about this for years, being from the south. It never did look like something that I would want to eat, so I have never had it. I suppose it could be good, but somehow I still don’t think I’ll eat it. Yes, it’s good to indulge in forbidden fruit once in a while . . . but this sounds disgusting on a number of different levels. I have to say its FABULOUS! If you have never tried it you do not know what you are missing. My vegetarian boyfriend said have you ever had chicken fried steak? I was baffled. He said I remember that from when I was a kid and it really was SOOO good, heck I had to try it. YUM OH! For the truly novice CFS cook: Good roundsteak (especially if tenderized) can be used. Cut into small pieces or strips. Oil must be very hot when you put meat into it. Do not turn the meat more than once, and it will “float” loose when it’s ready to turn. Don’t try to turn it too soon or you will lose your “fry.” Do not stack when plating the pieces, or they will be soggy. Brunnhilde, please allow a question… Are you from New York City? Ha-Ha! Please come down to central Texas and partake…..
Just like the movie “Sweet Home Alabama” there is a quality of life far, far greater than you have experienced. Your second course will be salsa and peppers, girl. We fixed this 40 years, when in the Air Force, and stationed in Germany. It was our favorite meal to fix for company, because it fed many, and everyone loved it. We used cube steak, or round steak pounded, and added lots of potatoes and carrots to the pan as it cooked. I can tell you from experience Marty that New York City has not yet discovered Chicken Fried Steak! Their loss, our perfect secret! But what does gigem mean? Gig ’em is a saying to get the Texas A&M football team all riled up before a game. It means to spear your competition with a pronged spear used for fishing, called a gig. Was getting your Italian sausage recipe when I saw the chicken fried steak. Thought I would pass along some interesting info about chicken fried steak. The reason the outside “fry” seperates from the meat in a restaurant is because they are not allowed to bring the meat up to room temp. If you bring the meat up to room temp before dipping in the egg-milk-flour then it will stick to the meat when you fry. Cold meat will not stick to the fry. There is also a meat cuber which is called “Fast Cutlet Maker V2” that smash the flesh and create clear cube pattern on it. It is very popular among polish people.